A bag similar to this will be created - but not this one. The Evening Echo newspaper announced today our plans to launch a designer Fairtrade Cotton shopping bag for Leigh Shoppers. We are on the look out for shops/businesses or organisations who have committed to the Fairtrade Town Campaign by using or stocking at least two different items that carry the Fairtrade Mark. This could be Coffee/Tea and Fruit Juices in your staff room or by carrying products on your shelves. Those that qualify are invited to sponsor a square with their company logo on one side of the bag to help fund the cost of production. The reverse side of the bag will have a funky attractive design - a must have for those stylish people living in Leigh. 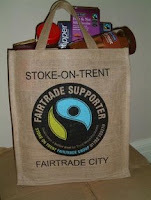 The bag will then be available in outlets across Leigh that carry Fairtrade items for purchase at a minimal cost. Funds raised will help support the campaign. If you are a business who would like to help with this idea or have their logo featured on the bag - please email us on info@fairtradeleigh.org.uk It is also great publicity for your business/retail outlet!